I am a Nook Color user as well as an Amazon Kindle Fire user. I have some books from my collection on one device, and some books on the other. 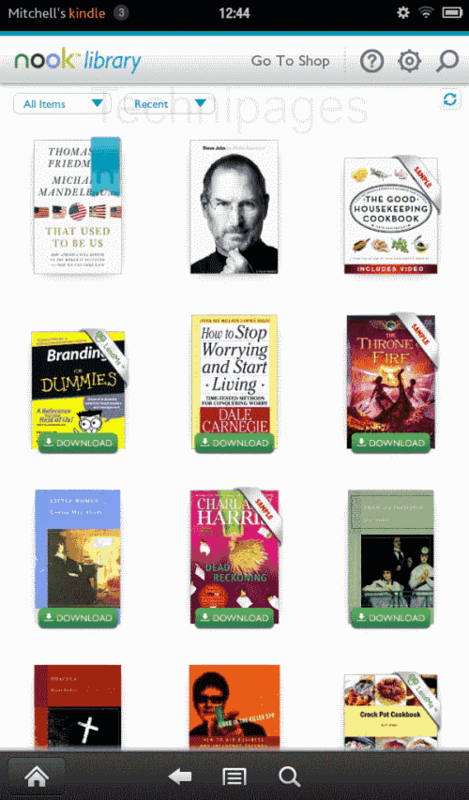 I had to learn how to read Barnes & Noble Nook books on my Kindle Fire. Here’s how to install the Nook Android app on the Kindle Fire so you can do so. Open the Kindle Fire web browser and go here to download the Nook apk file. You now should have the “Nook” app listed in the “Apps” area on your Kindle Fire. Open it and type your Barnes & Noble credentials when prompted. You’ll have access to all of your BN purchases. Some users are reporting that they are using GetJar to obtain the Nook app for their Kindle Fire. I find the method above easier though. the download worked for me and i was reading fine earlier. but once the nook app closed i cannot find it anywhere on my fire tablet. do you know where it is in the directory? This may work with ver 2017 Kindle Fire 8 but not with ver 2018. The nook file never stopped downloading. After a day I erased it and started again but this time it wouldn’t appear in the download window at all! Need another trick. This one has been blocked by Amazon. I got to the app, clicked download the most recent version, the app showed up, but there is no install button and no indication that it downloaded. Any thoughts? Thanks. Yes! Yes! Yes! Using APKMirror, the Nook app installed perfectly on the 7th generation Amazon Fire 7 I bought in February of 2018. Now I can access all my ebooks on one small, inexpensive, tablet that I don’t have to worry much about when I throw it in my bag. I just installed getjar and have downloaded to my Kindle Fire a book that is only available through B&N as a Nook book .The process was quick and easy. I tried the other method recommended first and for some reason, couldn’t do it. I am thrilled and very happy.